Frenchman Georges Irat only started out on his automotive adventure in 1921. He built small cars that were sporty enough to win rallies and races, while also being real family cars. All models were powered by four-cylinder overhead-valve engines of his own make. They consequently took their places in the starting line-up of the Le Mans 24-hour race in 1923, 1924 and 1926. In 1927, Irat introduced a larger model with a 3.0 litre six-cylinder engine. Owing to increased competition, however, this model never enjoyed the success of the smaller two litre cars. In order to reduce the price, during the '30s Irat sold cars with a six or eight cylinder engine by Lycoming, but these did not sell well either. Irat therefore decided to once again devote more attention to smaller models. In 1935, a sports car with a 954 or 1100 cc Ruby engine and four-wheel drive was introduced. These were sold almost exclusively in France. 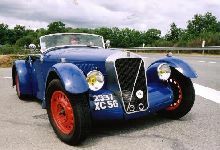 Once some 1,000 of the sports cars with a Ruby engine had been sold, Irat switched to the engine and drive of the Citroen Legere. After the Second World War, the Irat make disappeared from the market altogether.